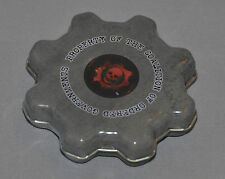 Gears Of War Replica COG Tag Die-Cast Aluminum Chrome Finish SUPER RARE!!! Condition is New. These are NOT die-cut pressed trinkets. These pieces have substantial weight and depth. Each unit has a unique CSID# engraved. Gears Of War 2 on Xbox 360. Official pre-release, promotional-only 2008. Gears of War MINTS - COG TAG Metal Tin - GOW1 GOW 1 (Epic Games) Sealed!! Weight: 6.00 oz. Includes: 12 Pcs Mint Tins. UPC: 611508172573. This is a sealed, embossed, 1.2 oz. This is a new, never opened tin of mints. 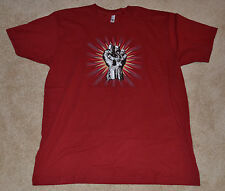 Red - XLarge (Pit/pit 23" Top/bottom 30"). Limited Numbers only given out at E2 2012! I amclearing out everything that I have collected over the last 30 yearsmost of it isn’t even open and is in good condition. Getthem cheap, complete your collection or get them as a gift! These are very rare. They're 100% NECA legit (AUTHENTIC) collectibles. NIB Gears Of War “Headshot” Locust Drone -7in action figure -Real metal COG tags included. -Manufactured by Neca -The item is as shown on the photo. -This item was stored at smoke/pet free environment in a plastic bin. 2 oz of mini peppermints. Gears of War 3 Marcus Fenix & Locust Grunt Toys R US exclusive action figure 2 pack released by NECA in 2011. Package is sealed and figures are never removed from package and in near mint condition or better. Packaging is mostly straight. Packaging has some light scratching here and there. Packaging as one small thin mark on the front face near Marcus' right hand. Continental US shipping only. Packed using bubble wrap and packing peanuts. Made From Acrylic, Polyester, and Spandex Materials. 98% Polyester 2% Spandex. Machine washable. Each cog-shaped tin is filled with 1.2 oz of mini peppermints.